The incoming Russian President, Dmitry Medvedev, has said his country is not happy about the prospect of Ukraine and Georgia joining Nato. Speaking in an interview with the Financial Times of London, he said such a move could affect European security. 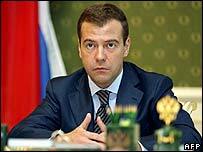 Mr Medvedev said no country would be happy about a military bloc to which it did not belong approaching its borders. Asked about recent troubled relations with the UK, he said he was open to restoring full co-operation. Mr Medvedev is succeeding Vladimir Putin after winning a landslide victory in the presidential election earlier this month. He has pledged to continue the policies of Mr Putin, who is expected to become his prime minister. The issue of admitting Georgia and Ukraine - both former Soviet republics - is expected to be discussed at a Nato summit in Bucharest on 2-4 April. "We are not happy about the situation around Georgia and Ukraine," Mr Medvedev said. "We consider that it is extremely troublesome for the existing structure of European security. "No state can be pleased about having representatives of a military bloc to which it does not belong coming close to its borders." In a separate development, direct flights between Russia and Georgia are expected to resume on Tuesday, 18 months after Moscow suspended them in a row over alleged spying. A Georgian passenger plane will fly from Tbilisi to Moscow, returning later in the day. Georgian President Mikhail Saakashvili, a US-educated lawyer, swept to power after street protests in 2003, dubbed the "Rose Revolution". He favours closer ties with the West and has accused Russian politicians of interfering in Georgia's affairs. Ukraine's Orange Revolution in 2004 swept away a pro-Russian government and replaced it with one that looks to the West for support and now wants to join Nato. But President Viktor Yushchenko has been engaged in a long-running power struggle with Viktor Yanukovych, a former prime minister whose supporters are generally more pro-Russian.